Professional Land Corporation has over 700 prime properties that are not listed on the MLS. Here is a small selection of our Prime Land Parcels. Description: This prime .75-acre land parcel is located on paved Malaki Road, between Quinault and Central and between Powhatan and Ottawa. It is nice level terrain, situated in an already established business park. The CS zoning would permit a restaurant, convenience store, office building, liquor store and other commercial uses. These uses could prove themselves very popular in an area of many nearby businesses that currently lack these amenities. This property is situated to the south of Highway 18, and in close proximity to Granite Hills High School, the Apple Valley Post Office, Bar Lumber, Budget Vehicle Rental, and nearby restaurants. zoning: CS Commercial. Permits hotels, motels, liquor stores, grocery stores, office buildings, restaurants, health clubs, photo and dance studios, convenience stores, beauty shops, and parking structures, subject to the approval and requirements of the city of Apple Valley. Description: This property is located on the east side of Badger, about .12 miles east of Koala, and approximately .63 miles north of Air Expressway. Air Expressway is the main thoroughfare leading to the entrance of the Southern California Logistics Airport, which is poised to become one of the largest cargo airports in the United States. The parade of billion dollar companies like Boeing, General Electric, FedEx, Pasha Group, and the Burlington Northern Santa Fe Railway has already begun at this Airport. 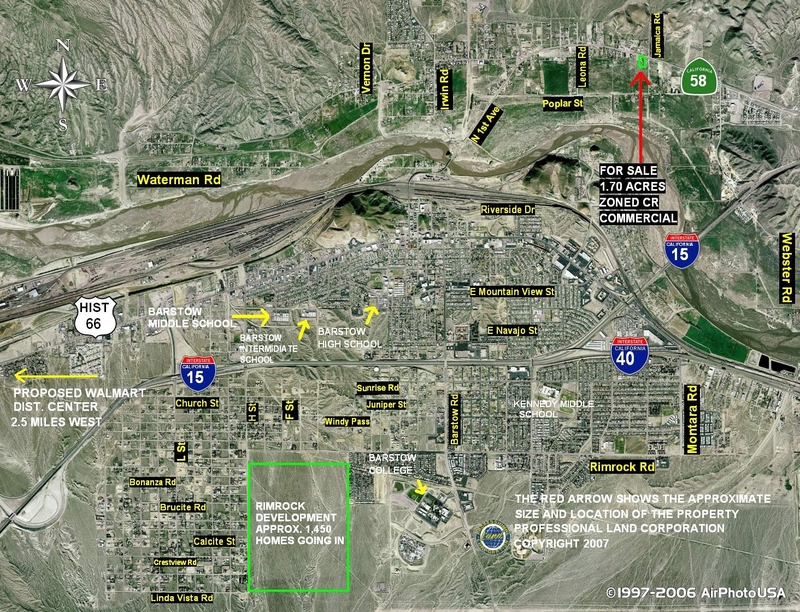 This property is situated in close proximity to residential housing, about 1-mile north of the Adelanto Industrial Parks, about 2.31-miles northwest of the Adelanto City Hall, and about 2.15-miles west of U.S. Highway 395. D.R. Horton is selling new homes in Adelanto at Magnolia at Manzanita. These homes range in size from approximately 1,649 to 3,063 square feet and consist of homes that have 3 to 5 bedrooms, up to 3 baths, 2 car and 3 car garages and sell from about $180,000 and up. 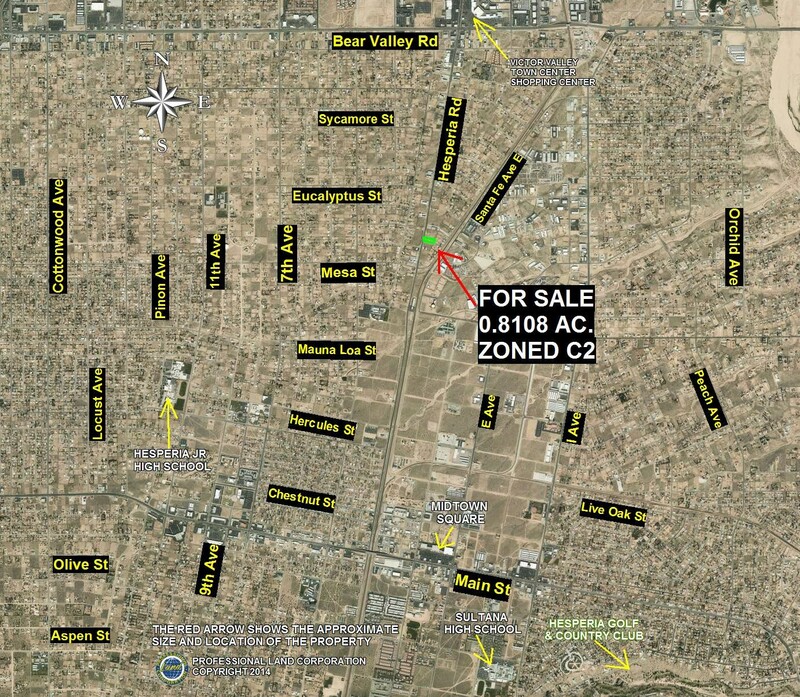 This 2.42-acre property is located in recorded Subdivision Tract 5800.
zoning: R1-.5: This zoning would permit one single family home per half acre, subject to the requirements and development approval of the city of Adelanto. Description: This prime .8108-acre property is well located right on well-traveled Hesperia Road in the Hesperia city limits. Hesperia Road is the main thoroughfare that is widely used by Victor Valley residents as an alternative to I-15, because it extends from Hesperia all the way to Highway 18 in Apple Valley, and can be traveled with very few stop signs or signals. Hesperia Road has an enormous traffic count, and is the location of Mars Candy, and Goodyear. This .8108-acre property is well situated between Bear Valley Road and Main Street, situated on the east side of Hesperia Road, just south of Eucalyptus. It is located about 1.33-miles south of Bear Valley Rd. and about 2.04-miles north of Main St., and about 2.67-miles northwest of Sultana High School. The location of this property is situated close to the Mall of Victor Valley, the Victor Valley College, Spring Valley Lake, Circuit City, Car Dealerships, and a large array of some of the most important developments in the Victor Valley. This .8108-acre property is situated in recorded Subdivision Tract 5037.
zoning: C-2 Commercial: This C-2 zoning permits an office building, restaurant, motel, convenience store, car rental business, a bank, car sales and a wide variety of other retail or commercial uses, subject to the approval and requirements of the city of Hesperia. 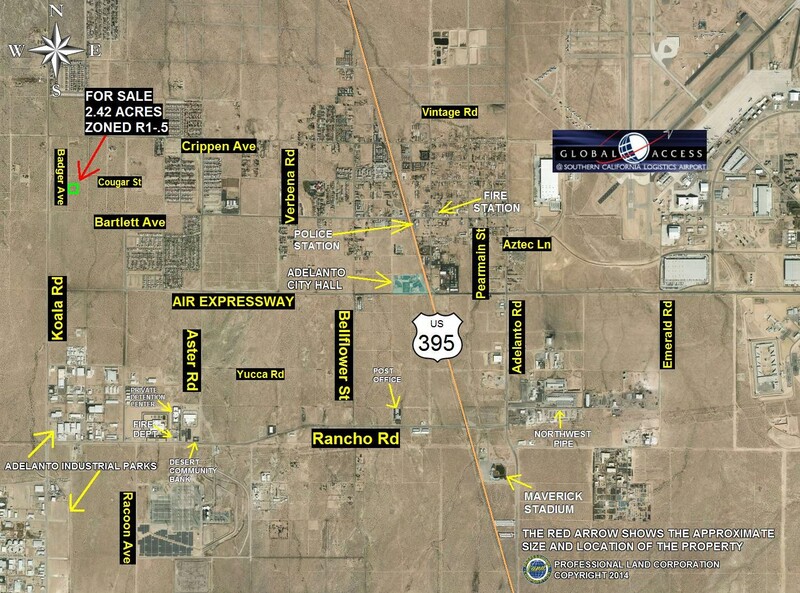 Description: Prime, upscale Commercial 1.1-acre parcel with paved frontage on the south side of Bonanza, located approximately, .42-miles west of the I-15 Freeway, about .25-miles south of Hwy 18, about .77 miles southeast of McDonalds and the Ralph’s shopping Center, about .92-miles southwest of the Victorville Auto Mall, about .25-miles from the Shopping Center that has Starbucks and Target, about .81-miles southwest of the Victorville City Hall, about .40-miles southwest of Kaiser Permanente Hospital, and about 660 feet to the west of Amargosa. Amargosa is the street where the Victor Valley Mall, furniture stores, Pontiac, Ford, Target and some of biggest names in the Victor Valley are located. 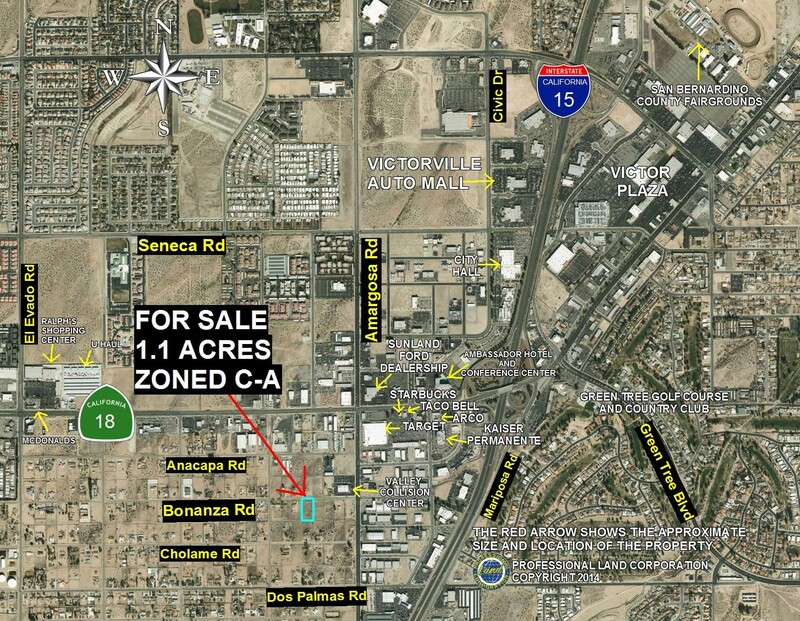 The property is situated on Bonanza, which is about 315 feet west of the Valley Collision Center at the corner Bonanza and Amargosa. This property could be ideal for a multi-story office or medical building, a pharmacy, a bank, or other commercial uses. 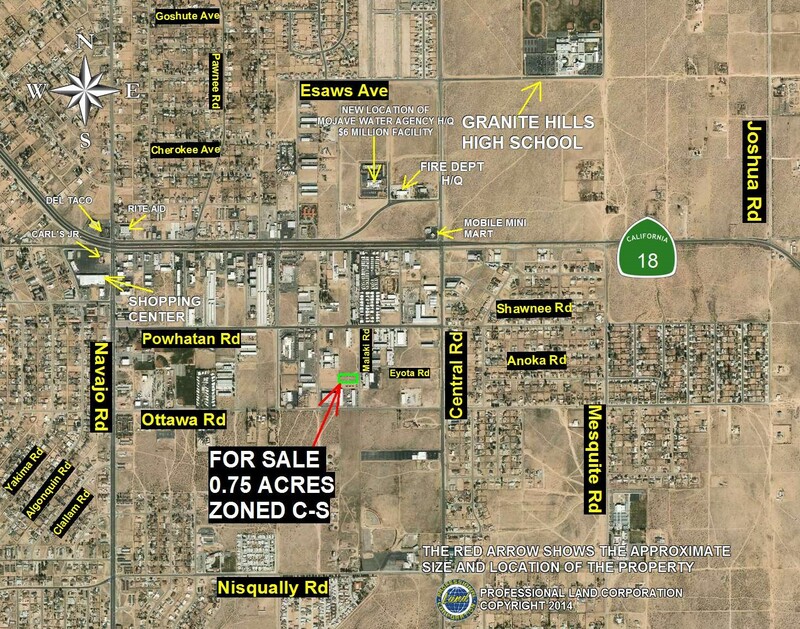 Located in a prestige area of Victorville, this property shows amazingly well. zoning: CA-Commercial Administrative: Allows for an office or medical building, a travel agency, pharmacy, a bank and other commercial type uses, subject to the requirements and development approval of the city of Victorville. Description: Description: Prime 1.7-acre commercially zoned land parcel right on Highway 58, located about 1.16-miles northwest of the 15 Freeway, about 2 miles north of State Highway 40 and about 6.41-miles northeast of the Barstow Factory Merchants and Tanger Factory Outlets in Barstow. Highway 58 has a huge traffic count and goes from Barstow west to Kern County. This property is also located close to schools and housing. The Barstow Area is especially well known for the Factory Outlet Malls in Lenwood that have over 120 stores, including Polo Ralph Lauren, Gap, Calvin Klein, and Coach. zoning: Zoning: CR: Permits auto sales and rentals, bar, tavern and night club, convenience stores, restaurants, medical or professional office building, hotel or motel and other commercial and retail uses, subject to the development approval and requirements and the County of San Bernardino. Thank you for viewing the above featured land parcels. If you would like to learn more about any other land parcels in Proland’s large private inventory, please contact us.